It’s centered around an hour-long, full-body workout that promises to challenge you and train your body using a treadmill like you’ve never used one before. Just be ready to climb great heights. Founder Paul Rothschild started SWEAT 1000 in 2010 in his native country South Africa. He had always wanted to create a functional High Intensity Interval Training (HIIT) fitness routine with tons of physical benefits that could be done in a short span of time. Rothschild sought to “eliminate all potential excuses that might exist,” to blow off a workout, he tells PaperCity. “The workout is one hour long, but it’s focused time,” he says. The workout combines components of interval training, functional training, core stability work, athletic training, and agility training. With SWEAT, “you come in and you’ve got your hour. It’s your time.” Classes are designed for 40 people, with 20 treadmills. Half of the class begins on a treadmill, and the other half begins on the floor. SWEAT is shorthand for Specialized Weight Endurance Athletic Training. How about the 1000? The striking number stands for the number of calories you could burn in one SWEAT class. Calories burned is based on a weight ratio, so generally women will burn slightly less than 1000, and men can burn more than that. These classes are split between high-energy bursts on the treadmill and on the floor, alternating between each in short or long intervals. Floor work covers a range of exercises with different targets — strength training, core work, suspension training, and more. Workouts on the floor include core work, strength training, suspension training, and more. The routine is geared toward people of all fitness levels. Instead of beginner, intermediate, and advanced, the categories pertain specifically to treadmills: walkers, joggers, and runners. Exercisers from all categories work out in same class. “We make sure that we’re making it for everyone,” SWEAT fitness instructor Ana Barron Strouse says. 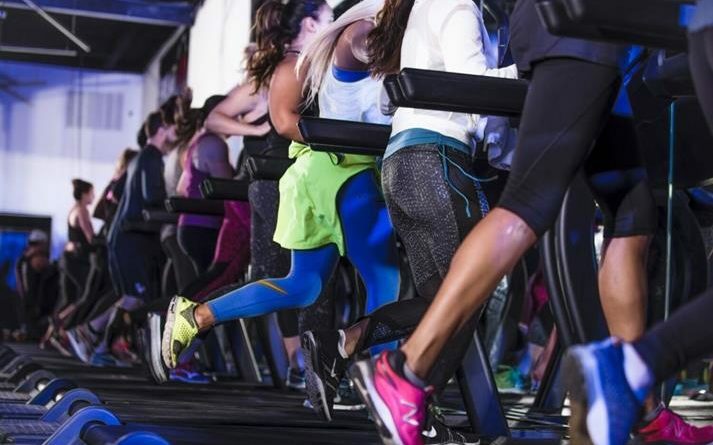 If treadmills fill you with dread, you aren’t alone. But instead of running screaming in the opposite direction, you should run on the treadmill itself. You could be one of many who leaves a SWEAT class singing a different tune, Rothschild insists. Do you believe him? “A lot of people come in initially and say ‘I really don’t like the treadmill,’ ” he notes. The common complaint? It’s mindless, you’re walking at the same pace, and you aren’t really going anywhere. “In our environment, we remove the monotony,” with the Free Motion Incline Trainer. The souped-up treadmill goes up to an incline of 30 degrees. Meanwhile, the average treadmill you’ll find will go up just 15 degrees. The benefit of the greater angle? Research has been done on the benefits of high incline walking. At a steeper incline, master activation levels are elevated. “Your body is burning three times more fat inclined as opposed to just running flat,” Rothschild says. The incline breaks up the monotony. Thirty degrees may sound like a tall order, but it keeps things interesting — and the incline actually keeps changing. Throughout the class, trainers call out the different inclines and speeds exercisers need to switch to keep up. Numbers are shared for walkers, joggers, and runners. The instructions differ from moment to moment, and from class to class. This approach means you never really know what to expect, which keeps things fun and has physical — and mental — rewards. “We’re always changing, so your mind naturally becomes stronger,” Strouse says. SWEAT instructor Strouse found that it was achievable, despite initially finding SWEAT intimidating. She started taking classes back in 2015 when she and her husband were living in Cape Town, South Africa. “Paul was very supportive,” she says. Even though Strouses’ first impression was “everyone just looks so fit, I don’t know if I can do this,” she quickly realized that no one was going to judge her. The SWEAT 1000 membership model is based around accessibility. The first class is complimentary, and Rothschild is certain that “once you have that experience, you’re going to want more and more and more.” Boutique fitness isn’t the conventional commercial fitness model, he says. It does not rely on getting a whole lot of members who never even come. SWEAT “takes away the commitment factor,” allowing exercisers to structure their routine how they want. Their New Year deal is $200 per month for unlimited classes. You can also purchase sessions by the class, or get a package of a certain number of classes to take over a certain time span. For example, if you choose to do 50 classes in 50 weeks, the total is $1,100, or $22 per class. View all the pricing options here.